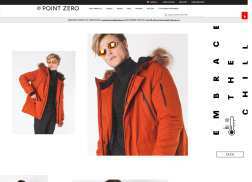 Point Zero is the one stop shop for the finest men's and women's apparel. Choose from a range of trendy sweaters, shirts, jeans, dresses and skirts. Visit the website to see available items and to order. Get 20% off $50+ orders. Limited time only. Get 20% Off Kids Collection. Get 25% off all regular priced items. Halloween Special! Get 31% Off Sitewide. Excludes sale items. Get up to 70% off selected summer styles for limited time only. Get 40% off all regular priced California MoonRise styles. Get 40% off regular price items. Get 40% off Women’s Collection. Excludes California MoonRise. Get 50% off Fall-Winter 2015 collections. Get over 30% Off select Fall Jackets. Get 50% off Outerwear. Price adjustments cannot be made. Get 30% off all California Moonrise. Get 15% off all regular priced items. Limited time only. Get 20% off New Arrivals. Limited time only. Get 40% off the Beach Edit. Friends & Family Event! Get 30% off your order. Get 40% off all Spring Outerwear. Get Free Standard Shipping to Canadian destinations on orders of $50 or more. Get 30% off $100+ order. Get 40% off regular priced items. Get 50% off all Sweat Shorts.